Much like last week’s goat, this dish is all about comfort from the first whiff of its aroma, and perfect for these dreadfully cold winter days. Cooked long and slow, the pork grows more tender with each passing hour. When time to serve, you can serve it as-is over rice, or shred it. If you choose the latter, tacos or tasty sandwiches result. Versatility is its best feature and I take full advantage of all 3 options before the pot is empty. I have prepared this dish several times with no 2 meals alike. I’ve little experience preparing mole, so, I’ve played with the amounts of Mexican chocolate, peanut butter, and chili pepper. This recipe represents my last — and best, for me — attempt. Feel free to adjust them to suit your own tastes. In fact, please come back and share your changes. With so little experience with Mexican cuisine beyond tacos and chili, I am open to any suggestions. Coat the slow-cooker container with cooking spray. Cut the pork into large chunks (see Notes) before placing in slow-cooker. In a bowl, combine the chicken stock, spices, light brown sugar, chipotle peppers, chocolate, peanut butter and raisins. Stir before emptying bowl into the slow-cooker, fully covering the pork. Set slow-cooker to LOW and timer to 8 hours (see Notes). When finished, remove pork and reserve. Using a stick blender, food processor, or blender, purée the sauce until as smooth as you prefer. Return pork to slow-cooker before serving over rice, garnished with sour cream and cilantro leaves. Shred the pork before returning to the slow-cooker. Prepare tacos with shredded lettuce/cabbage, onion, sour cream, cilantro, and/or whatever toppings you prefer. This will produce a fair amount of sauce, particularly if you use a pork shoulder roast smaller than 4 lbs. (Been there.) In fact, too much sauce may be produced for tacos or sandwiches. Then again. some may love a good, messy taco or sandwich. If so, have extra napkins on-hand and go for it! 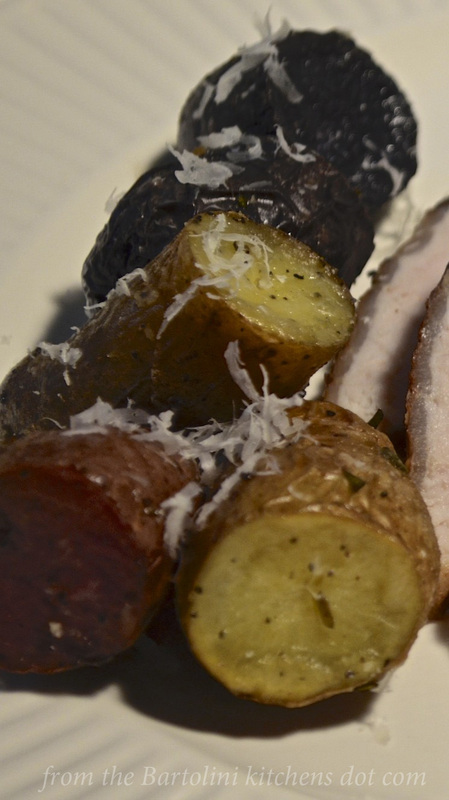 While cutting the pork roast, remove any bone(s) and trim away as much fat as possible. Reserve the bone(s) for use in your next pot of tomato sauce. If you prefer to use chicken, substitute 4 to 5 lbs of skinless, boneless chicken thighs for the pork. (This is not a recipe for chicken breasts.) Cut the thigh meat into chunks, flour, and lightly sear before proceeding with the recipe. If you haven’t 8 hours to wait for your dinner, you can set the slow-cooker to HIGH and cook for 4 hours. In short, 1 hour on HIGH equals 2 hours on LOW. When writing this, I didn’t consider that not everyone has access to Mexican chocolate. I hope the following helps. I use the brand pictured above principally because it is the most readily available. There is another popular brand, Ibarra, that I have yet to find in the groceries that I frequent. If all else fails, you can make your own, the recipe being found on The Balance website. In it, use semi-sweet or milk chocolate equal in amount to the Mexican chocolate indicated in the recipe. To that, add 1/2 teaspoon ground cinnamon and a drop of almond extract (optional). If nothing else, it makes a great cup of hot chocolate! I’ve made no secret of my love for tart cherries, buying bags of them every summer. In fact, for a number of years, I drove 100 miles to a Michigan farm to get the little red beauties directly from the farmer. Although I’ve plenty of uses for them, I always save some for this time fo year. A cherry muffin in February tastes almost as good as a piece of cherry pie in January. Both serve to remind me that the falling snowflakes will soon give way to cherry blossom petals. My recipe for cherry pie can be found HERE and the cherry muffin recipe HERE. Yet another year and yes, another Sammich! May everyone enjoy a fantastic Weekend. So much to be Thankful for. And may Everyone enjoy a Wonderful Weekend. Whether one celebrates the Holiday, we all have much to be thankful for. Long-time subscribers to this blog know that I didn’t exactly jump at the chance to start canning. The word “reluctant” comes to mind, though “stubborn” might be more appropriate. Well, in August, 2011, I did start preserving foods, with most of my attention focused upon jams and jellies. It wasn’t long before I was awash in jams and jellies of every kind, as were many of my tasters, located both near and far alike. At the time, I didn’t realize that there’s much more to jelly besides toast or peanut butter. 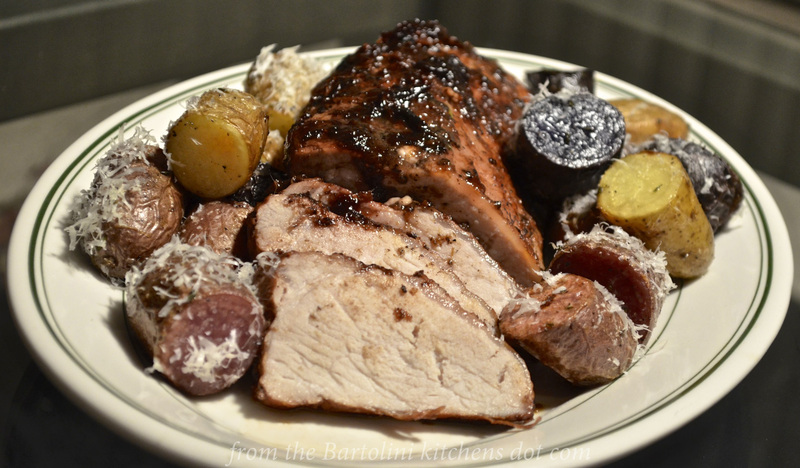 The day I used fig preserves to stuff a pork loin changed the way I viewed my jams. 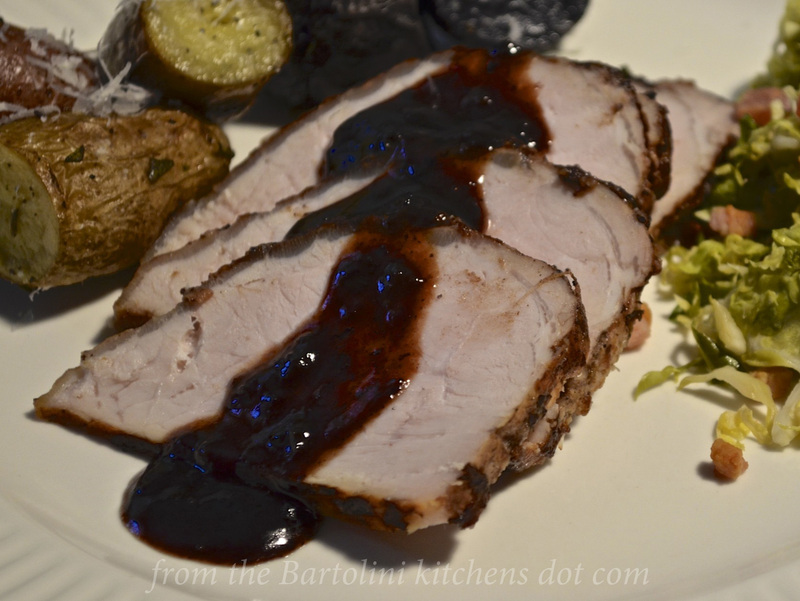 So, when I made Damson plum jam last year, I was already thinking of pork roasts. I knew I was on the right track when my friend, Betsy, author of the wonderful Bits and Breadcrumbs blog, mentioned the very same thing in that post’s comments. Betsy, it took me a while to get here but I finally made it! There is nothing complicated about this recipe. I’d guess that the toughest part of it will be finding plum jam, depending upon where you live. You could aways make some yourself but, if you live in the Chicago area, you’re likely to have a harder time finding Damson plums this Summer. You see, I plan on buying as many as I can find, all the while dreaming of future pork roasts. Speaking of which, there’s a pork roast with cherries in the works, as well. Some have noticed and mentioned that I’ve not been around the blogosphere as much as I once was. The fact is that I now have over 1100 followers, far more than I ever dreamt possible, yet I’ve continued to administer the blog as I did when you numbered only 100. As you can well imagine, this cannot continue and I’m imposing a limit on the amount of time I commit to blogging every day. I certainly hope that no one takes offense if I miss a post or fail to reply to a comment, for that’s the very last thing intended. I simply need to devote time to other matters. Thank you for your understanding. I’m very grateful for your ongoing support and encouragement. Heat butter and olive oil in a large frying pan, with cover, over med-high heat. Season pork tenderloin with salt and pepper before browning it on all sides in the pan — about 8 minutes. Remove the tenderloin from the pan. Use the white wine to deglaze the pan. Reduce the heat to medium before adding the ginger, balsamic vinegar, and plum jam, stirring until the jam melts and all are well-combined. Add the rosemary and return the tenderloin to the pan. 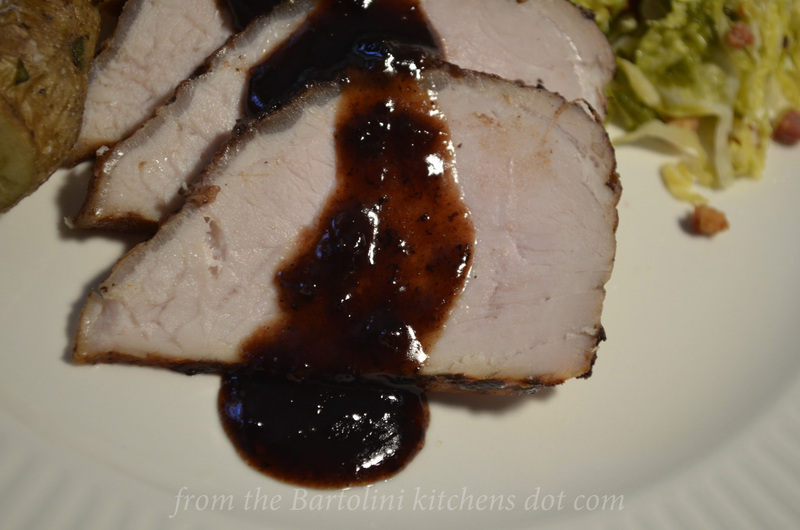 Use a spoon to coat the pork with the plum sauce. Cover the pan. Slice the roast and serve with the reserved plum sauce. This tenderloin is really so quick and easy to prepare that I didn’t want to spend time with complicated side dishes. 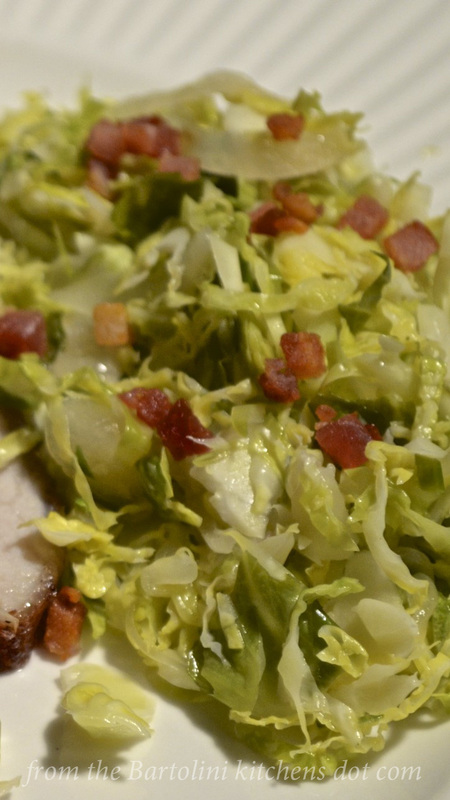 This inspired recipe combines shredded Brussels sprouts, pancetta, garlic, stock, and white balsamic to create a truly special dish. 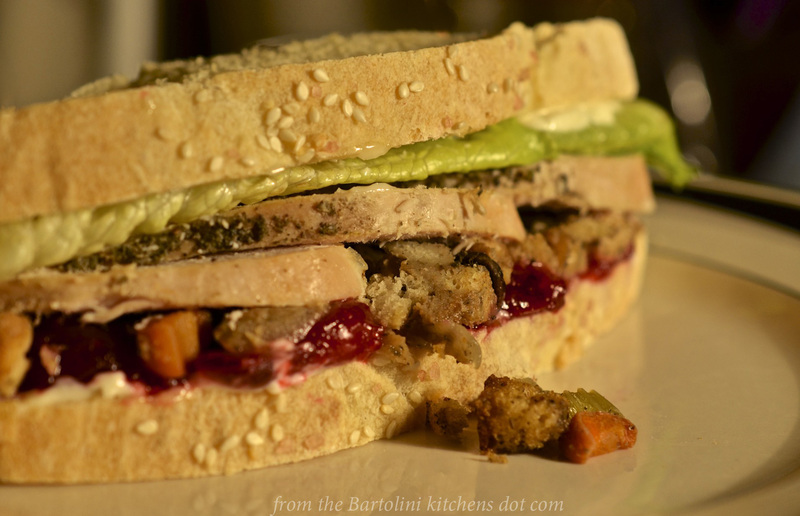 To see the full recipe, be sure to check out my friend Eva’s sumptuous blog, Kitchen Inspirations. Pre-heat oven and baking sheet to 425˚ F (220˚ C). Wash then cut fingerling potatoes to equal size. 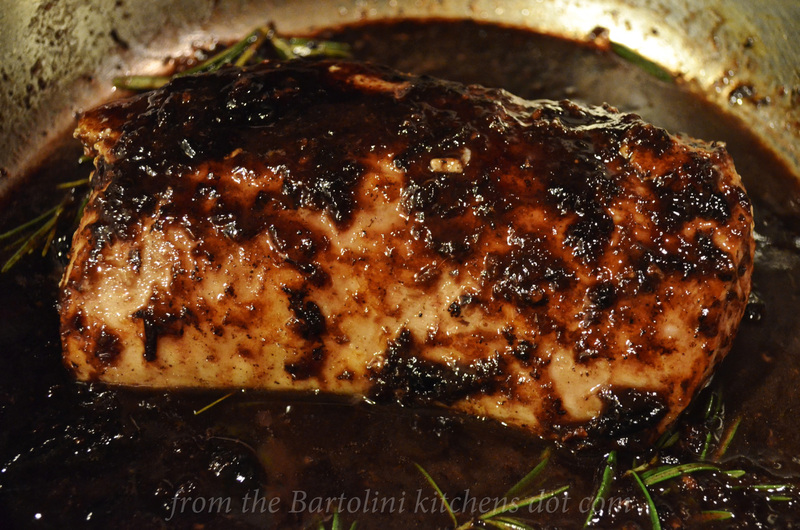 Season with crushed dried rosemary, salt, pepper, and coat with olive oil. Carefully oil baking sheet, add potatoes in a single layer, and roast until potatoes can be pierced easily, 20 to 30 minutes depending on size and quantity. Remove to serving platter, garnish with grated Pecorino Romano cheese, and serve immediately. I used plum jam, not jelly. As a result, the sauce may not be as smooth as some may prefer. If that’s you, while the tenderloin rests, I would suggest deglazing the pan with a bit of stock, wine, or water before straining the sauce through a fine mesh sieve. Once strained, place the sauce in a small pan and reduce it over med-high heat until it reaches the desired thickness. Taste for seasoning before serving. Not all fingerling potatoes are created equal and they’re likely to require varying times to roast. Cut the potatoes into even-sized pieces and all should cook evenly without any problems. If plums are in season, you could add a few plum halves to the pan and sauté them for as long, or short, as you like. Serve them alongside the roast. Hard to believe that it was two years ago when I was in the middle of my series on making cheese at home. When I demonstrated how easy it was to make mascarpone, I promised that I’d publish some recipes that would use your freshly made cheese. 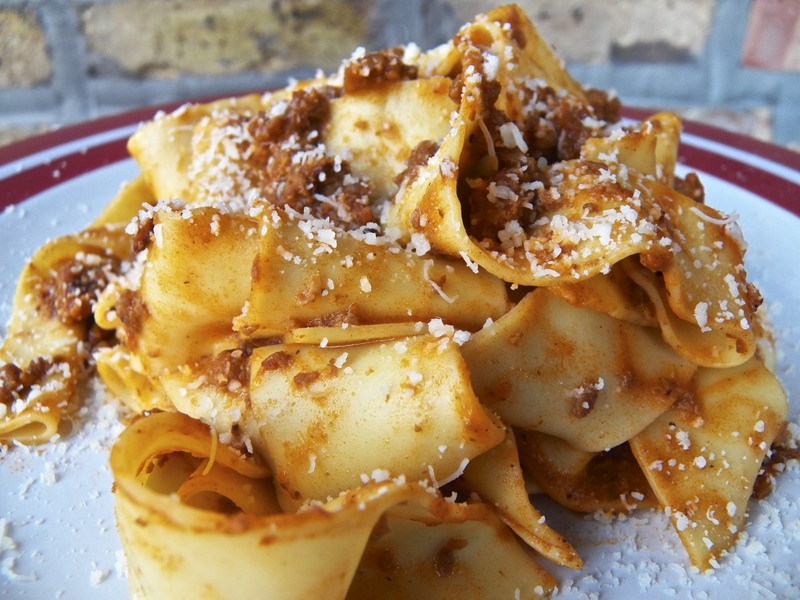 Today’s blast from the past is one of those recipes, combining pappardelle, spinach, Pecorino Romano, and, of course, mascarpone. It’s a delicious recipe and one you won’t want to miss. You can learn all about it by clicking HERE. Easter dinner back at the old two-flat was the 4th of the big holiday meals, with Thanksgiving, Christmas, and New Year’s Day being the other 3. Of course, there was a platter of freshly made ravioli on the table, as well as a beautiful roast. When I was very young, that roast was a baby goat. I don’t remember those meals but I do remember 2 of the goats. You see, the “kid” was brought home live and kept in the basement awaiting execution. After hearing its bleating that first year, I must have been 4 or 5 years of age, I was warned to stay out of the basement. Warned to stay out of a basement that I was certain contained a gazillion boy-eating spiders? No problem! The following year, again I heard the bleating and again I was told to stay clear. Well, I was a precocious child and knew that I was safe from the spiders if I stayed in the center of the basement, avoiding all corners, walls, and anything hanging from the ceiling. So, when Mom told me to stay out of the basement, I headed down there as soon as she looked the other way. Now, I may have been a precocious boy but I wasn’t one much for clandestine operations. Yes, I went into the cellar. Yes, I saw the baby goat. Yes, I felt Mom standing behind me. Yes, it was a tearful return up the stairs and into my room. No, I do not remember having goat for that Easter dinner. I think it was the next year when our dinner switched from goat to lamb, but lamb’s reign as our Easter dinner’s centerpiece was short-lived. My siblings — one or both — did not care for the meat and Mom prepared something else. The thing is, I can’t remember what it was she served. I was a bit older and, as I’ve said in other posts, my attention was fixated on that platter of ravioli. Everything else on that table was put there to distract the weak-willed, their appetites to be sated by these “lesser” dishes. I, being of strong heart and mind, kept my eyes on the prize, eating serving after serving of the tasty pillows. So, today, when asked what Mom served, I can honestly say is that all I remember is the ravioli. I started preparing a ham for Easter about 15 years ago. As much as I enjoy a baked ham dinner, I love a good ham sammich and spilt pea soup even more. And you can not have the latter if you don’t make the former. Early on, I baked my ham with pineapple rings and created a glaze with the juices and brown sugar. Then about 5 years ago, I saw ham prepared this way and decided to give it a try. I liked it so much that today it remains the only way that I prepare ham but you needn’t take my word for it. Four years ago, Max was just about a year old and celebrating his first Easter at my house. With my lovely ham covered in foil and resting atop the stove, I was in the dining room preparing the table. I returned to find Max feasting on the back side of my lovely ham. The front of the ham was carved and Max spent the rest of Easter in his crate. Still not convinced? A year later and it’s now Max’s second Easter. This time, the ham was placed on a counter, back against the wall where Max surely could not reach it. Again, I left the kitchen to tend to the dinner table. When I returned, Max was in his crate — licking his chops. Sure enough, though he could barely reach it, he did manage to score a few bites off of the side of my lovely ham, though he was smart enough to go to his crate before I returned. Again, he spent the rest of Easter in his crate. So, even though he’s never been left alone again in the same room with one, this ham is so good that Max would risk spending Easter in a crate just to have another taste. The facts speak for themselves. 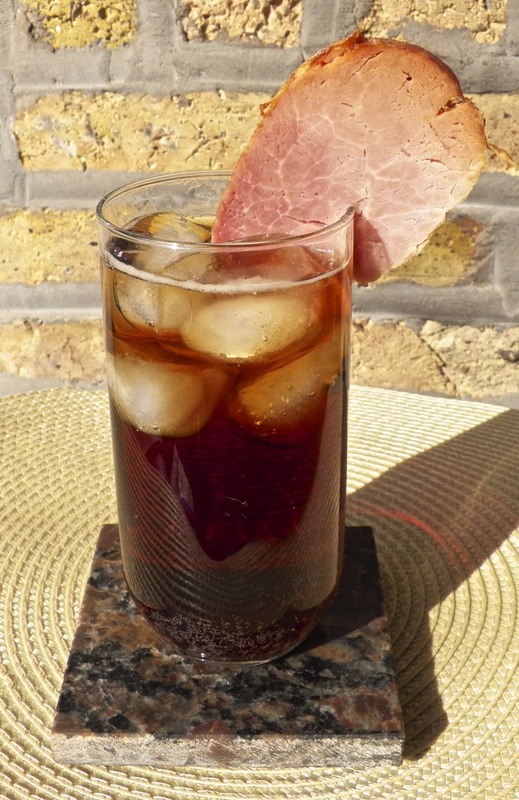 And as for the bourbon and Coke with the ham garnish? It was delicious! Place ham on a counter one hour before you plan to start preparing it. This will remove the chill from the ham. Lightly score the fat side of the ham, cutting in one direction and then again at a 90˚ angle, creating a diamond pattern. Place a whole clove wherever the cuts intersect. Pre-heat oven to 325˚ F (163˚ C). Using a medium saucepan, add 1 cup (236 ml) of bourbon, the cola, brown sugar, mustard, and thyme — AWAY FROM HEAT. Once the ingredients are combined, then heat over a med-low heat, reducing it until it is thick enough to coat the back of a wooden spoon. Place oven rack just beneath the middle position. Add 1 cup (236 ml) of water and the rest of the bourbon to the roasting pan. Place the ham, cut side down, in the pan. Insert a thermometer into the ham’s thickest part without touching any bone and baste the ham with some sauce before placing the ham in the oven. 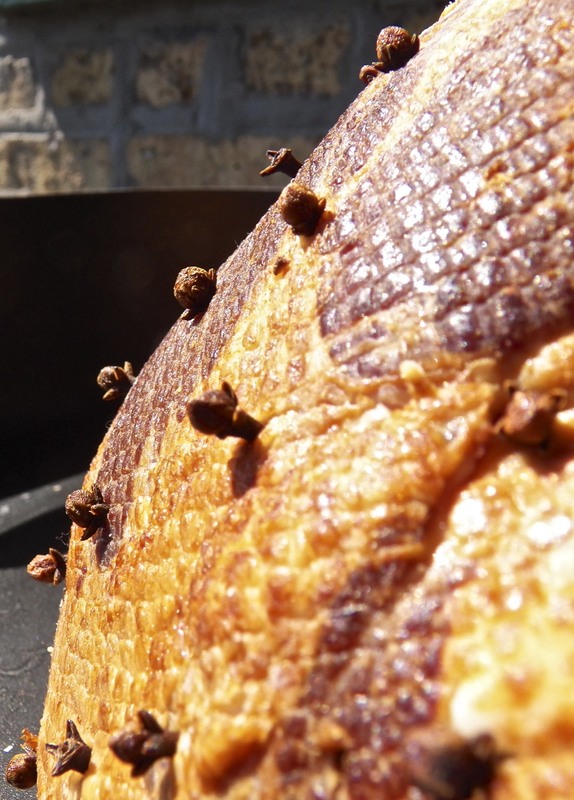 Continue to baste ham every 15 minutes until the ham’s internal temperature reaches 140˚ F (60˚ C) — about 90 minutes. Remove from oven, place ham on cutting board, tent with foil, and rest for 15 minutes. Meanwhile, pour pan juices into a grease separator and, after a few minutes, pour off the juices, leaving the grease behind. Into a small saucepan, add the pan juices and the remaining sauce over a med-high heat. Once it starts to boil, reduce heat to a simmer and reduce the sauce to the thickness of your choosing. Keep an eye on the saucepan lest it boil over. 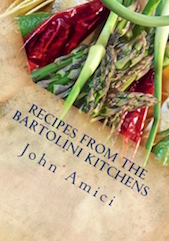 Inspired by Tyler Florence, “The Ultimate”, reprinted HERE. 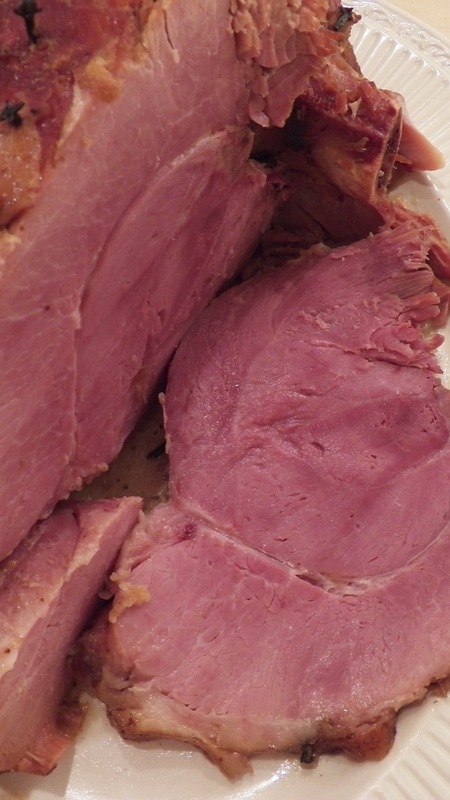 Today’s post featured a fully cooked, smoked ham (“City Ham”). I’ve also prepared smoked and partially cooked hams with this sauce, as well. Since both of these types of hams require being heated to 160˚ F ( 71˚C), it will take longer to roast them. So, I take a low and slow approach. I’ll pre-heat the oven to 300˚ F (149˚ C) and tightly tent the ham in its pan. I estimate it will take 15 to 20 minutes per pound to roast and at the 90 minute mark, I’ll start basting every 15 minutes. After 2 hours, having basted it twice, I’ll remove the foil for good and continue basting until the ham has reached the proper temperature. Though the ham will have a slight glaze by the time it has finished roasting, this is the bourbon, cola, & honey mixture is more sauce than glaze. 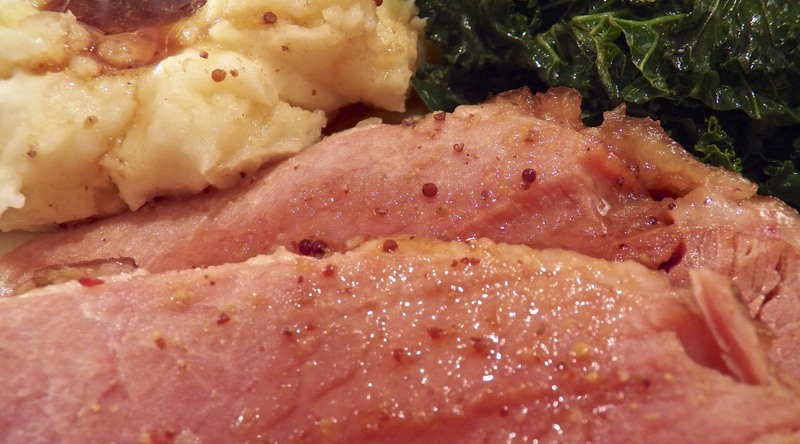 Frankly, I don’t prepare a ham nearly often enough to experiment with glazes to accompany this sauce. If I were to test glazes, I’d probably start with a honey-whole grain mustard glaze since those flavors are present in the sauce. No matter the ham or the roasting time required, I prefer putting it into the pan with the cut-side down. 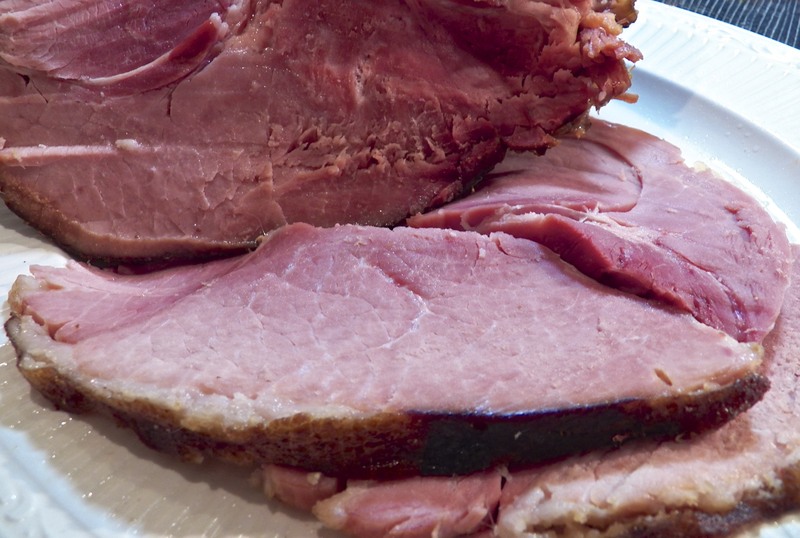 Though the first slice may not have the darkened color we’re all accustomed to seeing, I find that slice, as well as the rest of the ham, to be far more moist than a ham roasted on its side. So, why bake a ham? 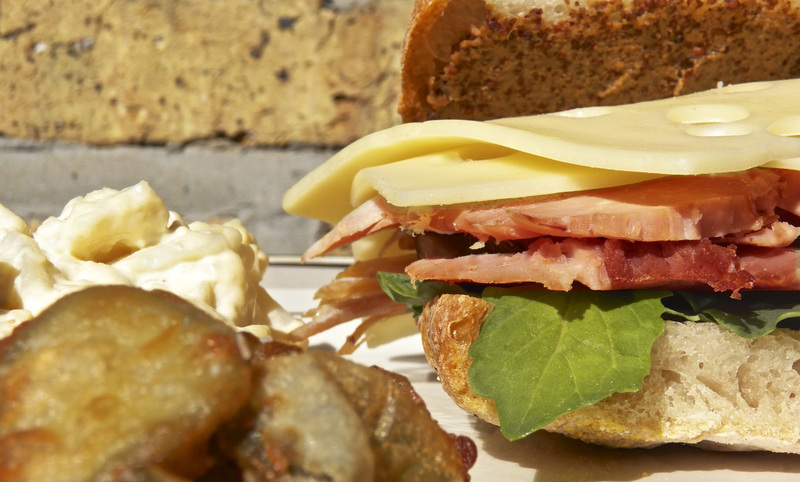 Roast ham, Swiss cheese, baby kale, and whole grain mustard on Ciabatta, with sides of potato salad and deep-fried pickle slices. When I wrote this post 2 years ago, I told of going to high-end groceries if I wanted to prepare the dish and, once there, the price was per clam!?!?! Well, not anymore. 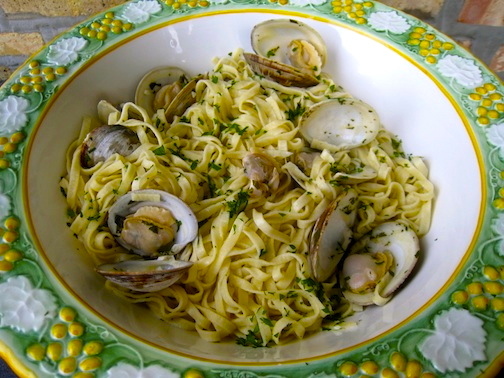 I now have a choice of places to buy my clams and all are priced per pound — and linguine with clams has graced my table more than ever. If you have access to fresh clams, you won’t want to miss our recipe. You can see it by clicking HERE. Short ribs weren’t on the menu when I was growing up. No, I had to wait until I was well past my youth, living here in Chicago, to discover them and even then it was purely coincidental. I had just moved into an apartment on The Lake and was checking out the neighborhood one Saturday when I “discovered” a Hungarian restaurant. Having looked at the menu, I was ready to order the paprikash when my waitress announced that the day’s luncheon special was short ribs. I opted for the special and that split-second decision became a life-altering event. For well over a year afterward, I dined there frequently and never sampled the paprikash, but I did order the short ribs every time. I introduced friends to my “discovery” and urged each to try the short ribs. You see, I was in heaven and was happy to share my good fortune with everyone — until that day. The following Saturday the place was closed, never to re-open. In the years since, more than a few of my favorite restaurants have closed, each after I uttered the fateful incantation. Once I realized the power of those words, I did my very best to avoid mouthing them but if you’re going to serve potent margaritas or top-shelf sake at below market prices, well, I can hardly be held responsible. Anyway, through the years, I’ve seen my favorite Chinese, Mexican, and Sushi restaurants all close, not to mention great little diners and hamburger joints. Perhaps the most painful closing of them all was my neighborhood Thai restaurant, which served the best Pad Thai on the planet. I was known as “Mr. John.” Since its closing 8 years ago, I’ve never repeated those powerful words in reference to any restaurant that I’ve liked. (Interesting to note that I have tried to use the magic on restaurants that should be closed as a service to my fellow diners. The fact that these businesses have continued, uninterrupted, mocks me to this very day.) So, aside from ruining the businesses — and dreams — of a number of immigrant families, just what does any of this have to with short ribs? Well, once my Hungarian restaurant closed, I took it upon myself to learn how to prepare beef short ribs. Mom, my first resource in such matters, suggested making them like a beef stew. So, my first attempts were cooked in a slow cooker and pretty much looked like a stew. 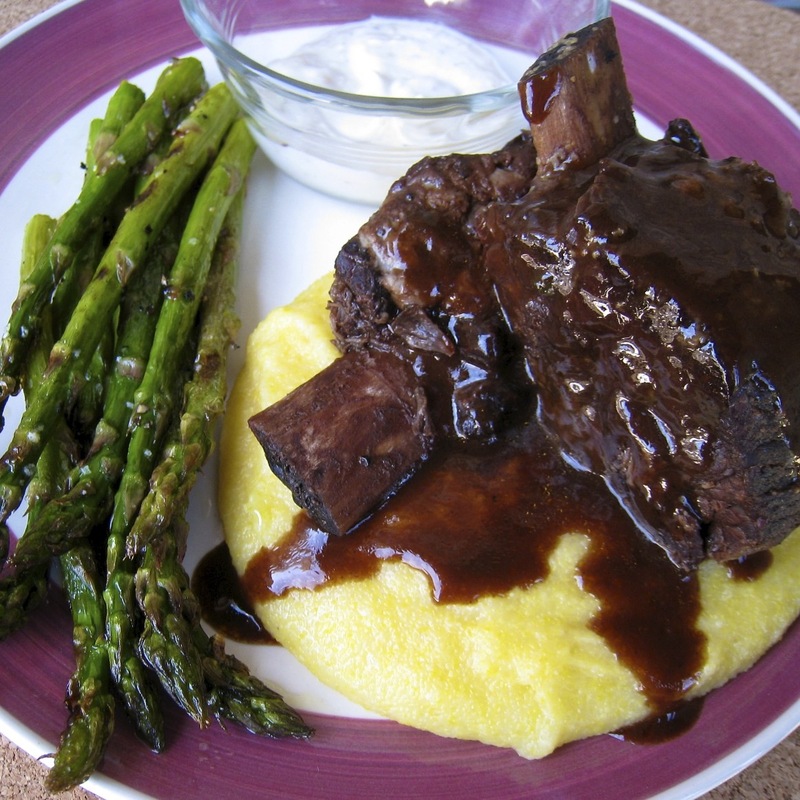 Looking back, my experiences preparing short ribs pretty much mirrors my growth as a cook, such as it was. Over the years, I learned to brown the meat first, make a roux and a sauce, use the vegetables for the braise only, added wine, moved the braise from the slow cooker to a Dutch oven, and, finally, added some balsamic vinegar to the pot. The spices, also, changed and, somewhere along the way, I began making horseradish sauce. 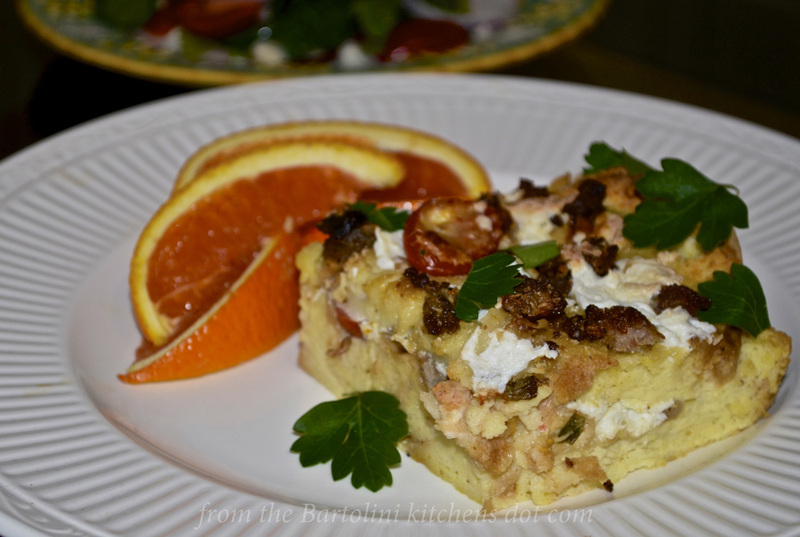 The recipes I share today are the last of a long series. Pre-heat oven to 325˚F (160˚C). Heat oil in a Dutch oven or heavy-bottomed pot with a lid over med-high heat. Meanwhile, use paper towels to pat dry the short ribs, season liberally with salt & pepper, and place into the now hot oil. DO NOT CROWD. You will probably need to brown them in 2 batches. Once the meat has been placed into the pot, do not disturb for about 3 minutes. Check one to see if it has browned. If so, turn each piece to brown another side, If not, continue cooking for another 2 minutes before checking again. Brown all sides of each rib before removing them to a platter and repeating the process with the rest of the ribs. Pour off excess grease, leaving 3 tbsp in the pot. Add the celery, carrots, and onion to the pot and begin sautéing. Season with salt & pepper. When the onion is translucent and the vegetables have softened, add the garlic and continue sautéing for about a minute. Add the flour to the pot, stir, and cook for two minutes. Use the red wine to deglaze the pot. Once finished, add the balsamic, beef stock and tomato paste. Season with salt and pepper and stir well. Add the thyme, rosemary, and bay leaves. Return the ribs to the pot, bring to a boil, cover, and place in pre-heated oven. Continue to cook for 2½ to 3 hours or until meat is fork tender and falling off of the bones. Carefully remove the ribs to a platter and cover with foil to keep warm. Pour the braising liquid through a strainer and place resultant liquid into a grease separator. Wait a few minutes to allow the grease to rise and then pour off the sauce. Serve the sauce as is. Place the sauce into a small pan so that it can be further reduced and thickened. Add more wine or beef broth and then reduce. No matter the choice, be sure to taste the sauce to see if additional seasoning is needed. The sauce may be used to cover the ribs before serving or left on the side. 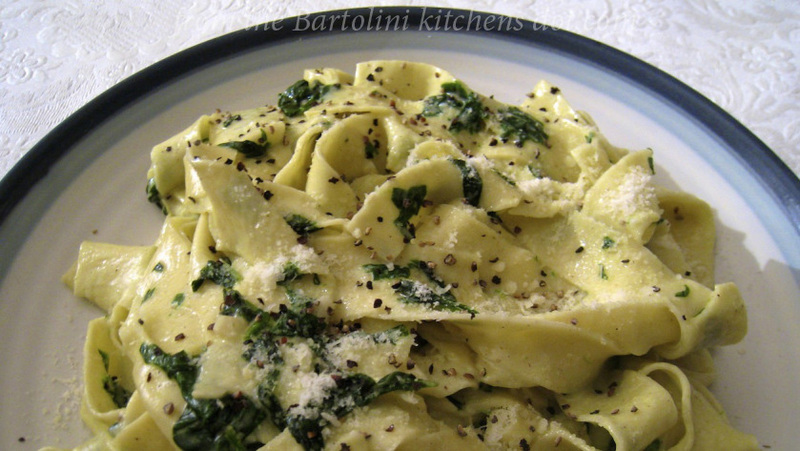 Serve immediately with mashed potatoes, buttered broad noodles, or polenta, as pictured. Combine equal amounts of plain yogurt (Greek pref.) and sour cream. Add horseradish to taste, some brown, whole grain or Dijon mustard, a dash or two of Worcestershire Sauce, and salt & pepper to taste. Mix well and refrigerate until needed. Be sure to make extra for the cole slaw. I always try to make extra ribs, gravy, and horseradish sauce. Not only are the ribs even tastier the next day, the meat can be pulled apart, similar to what is done with pork, and used with the extra gravy to make sandwiches. 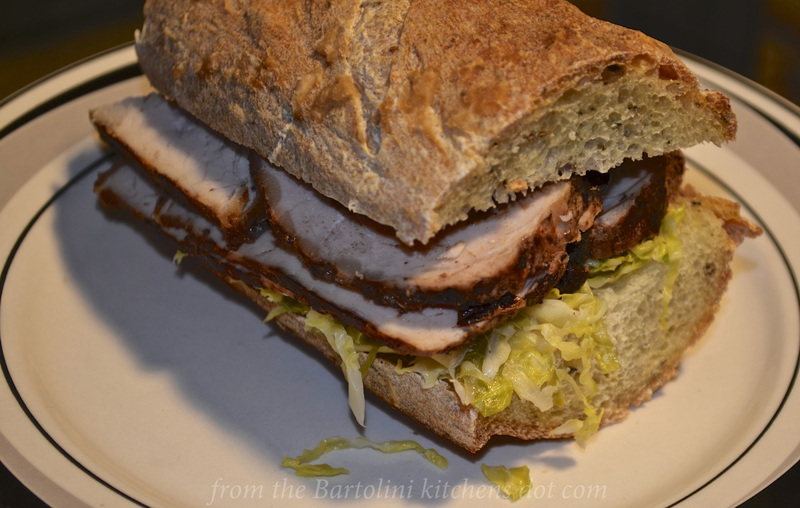 The extra horseradish sauce can be used as a dressing for cole slaw to top off the sandwich, as pictured, or as a condiment. 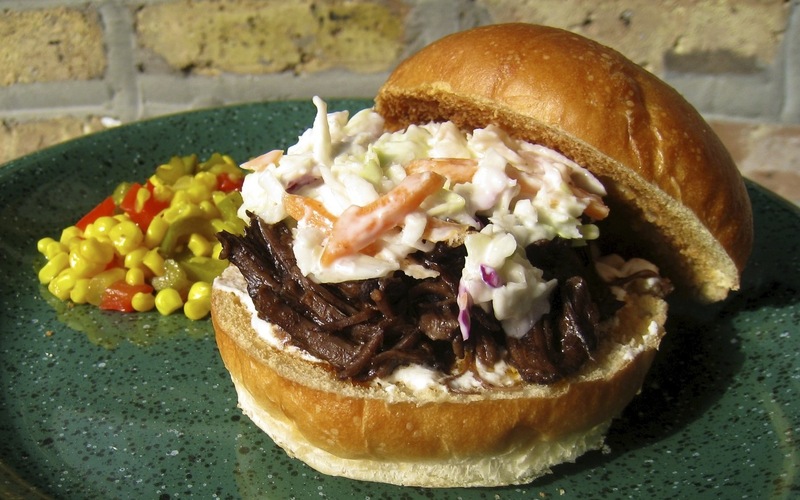 If used to dress slaw, you may wish to add more yogurt, sour cream, or a little mayonnaise, to suit your tastes. Be sure to come back next Wednesday when, as promised, I’ll show you how to make mascarpone.